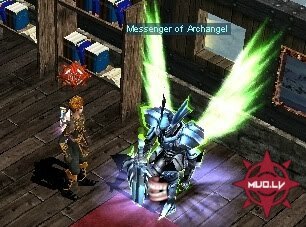 One of the strongest warriors in the Continent of MU, the Archangel; has secretly been laying watch over the lands that he has sworn to protect. As Kundun presence approaches, the archangel has been warding off all the monsters trying to invade the Continent of MU. But alas, our Guardian Archangel can not fend on his own forever. Kundun Army has invaded his Castle and has overcome the strength of the Archangel. The Archangel, injured and in peril; summons forth the warriors of MU, to come aid him in his most dire time of need. Unable to summon his strengths without his Divine Weapon of Archangel, you have been asked to infiltrate this now over ridden Castle and retrieve his weapon for him. Fight thru the bridge and gain entrance into the castle. Be the first to retrieve the Divine Weapon of Archangel, and return it to him will complete the event. With the Cloak of Invisibility, you will be allowed onto the castle grounds. Will you be able to infiltrate the castle and retrieve what is needed without fear? When you have successfully created the Cloak of Invisibility, you may use it to enter the Blood Castle. To Create the Cloak of Invisibility you must combine a Scroll of Archangel and a Blood Bone of the same levels. You will need the level of cloak that will match the level of Blood Castle you will be entering. You will need to create the Cloak of Invisibility using the Scroll of Archangel, the Blood Bone, and a chaos Jewel. Only items of the same level can be combined to create the Cloak of Invisibility for that specific Blood Castle.